The word “fossil” often conjures up images of petrified, hardened bones that have been transformed over time. But not all fossils are incredibly old or resemble rocks. In fact, some fossils look rather fresh. Part of a camel skull found near Fillmore, Utah, is a prime example. Back in 1928, while exploring near Meadow Hot Springs, a pair of high school students found an unusual skull at the back of a lava tube. The braincase and piece of jaw didn’t seem to be from a cow, horse, or other familiar animal, and so it eventually came to the attention of University of Utah professor A.L. Mathews. Mathews, in turn, sent the news along to famed paleontologist Alfred Sherwood Romer at the University of Chicago. And what Romer saw in that skull dramatically affected what experts thought of as the timeline of Ice Age life. Romer quickly identified the skull as that of a camel. But what species? The fact that the skull still looked relatively fresh suggested that the animal had died in the relatively recent past, within the range of thousands of years. There was even a scrap of muscle still attached to the back of the cranium, suggesting that the animal couldn’t have been entombed for especially long. There was a possibility that the camel might have been one of the dromedaries that were introduced to the western United States as pack animals during the mid- and late-19th century. But the anatomy was all wrong. The skull, Romer concluded, must have come from an extinct North American species that paleontologists knew as Camelops and had previously been found in places like the La Brea asphalt seeps in Los Angeles, California. 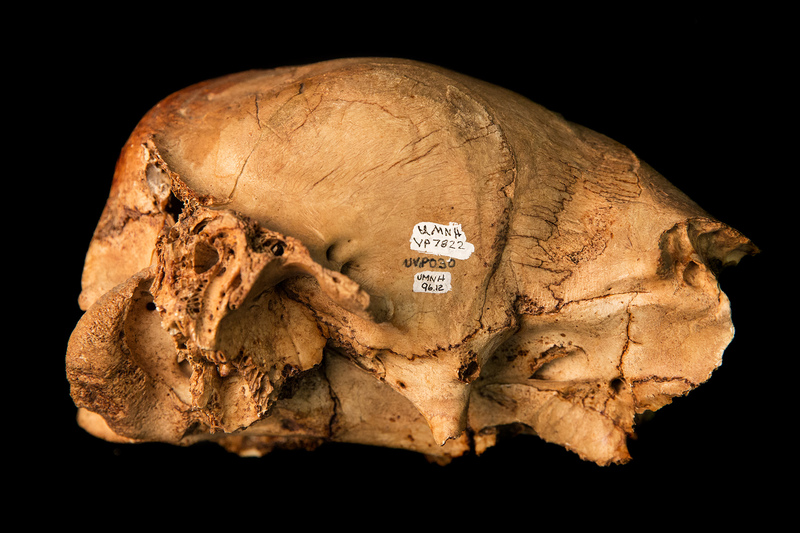 Romer understood that this discovery had major significance for understanding the lives and extinction of Ice Age mammals. Up until the unexpected find, paleontologists thought that North America’s Pleistocene camels came from the early part of the epoch and were wiped out by half a million years ago. This meant that any time paleontologists found Camelops or one of its relatives, that site was assumed to be from the early part of the Pleistocene. But the lava tube skull suggested that North America’s camels survived much longer than previously thought. Not everyone was sold on the idea. Romer’s colleague O.P. Hay wrote a terse response to the suggestion that the Ice Age timeline would have to be revised. In the years that followed, the camel skull went on display at the University of Utah Geology Museum before seeming to vanish. The skull was lost for decades, until relocated in the Utah Museum of Natural History collections in 1978. The skull’s rediscovery was the perfect excuse to get a radiocarbon date on the fossil and put the old debate to rest. Along with other finds and changing ideas about how the Ice Age unfolded, paleontologists Michael Nelson and James Madsen, Jr. got a date of approximately 11,100 years before present for the skull. “It was instrumental in demonstrating that camels survived to the end of the Pleistocene in North America.” NHMU Chief Curator Randall Irmis says. And this confirmed that Romer was right - in Utah, Camelops made it to the very end of the Pleistocene before going extinct along with other Ice Age favorites like mastodons and sabercats. How this extinction played out is still debated, but both climate change and hunting of large herbivores by humans appear to have played significant roles in why camels, horses, mammoths, ground sloths, and other megafauna disappeared from the continent. The skull found in that lava tube is a remnant of a time not very long before our own, when strange creatures like mammoths and camels mingled with black bear and bighorn sheep.